Straightforward, practical measures can make carbon taxes more acceptable to voters. Carbon pricing has spread widely in recent years, with around 40 systems now in place[i]. However, most emissions are not yet priced, and, even where they are, most prices remain too low. Both expanding coverage and increasing price levels face political obstacles. Overcoming these is essential for carbon pricing to play the role that it should in reducing emissions. Fortunately, evidence is now emerging on what can be done to reduce opposition from voters – overcoming opposition from powerful lobbies such as industry warrants separate approaches. The personal and wider economic costs of a tax are seen as too high. Carbon taxes are seen as regressive, having a disproportionately negative effect on low-income households. Carbon taxes are not believed to be an effective way to reduce emissions. Governments are seen as having a ‘hidden’ motive to increase fiscal revenue rather than curb emissions. However the study noted that people’s aversion to carbon taxes decreases over time after they have been introduced, particularly if the effects of the tax are measured and communicated. Phasing in carbon taxes over time, introducing the tax at a low rate but having commitment devices to subsequently increase the rate to more efficient levels. Redistributing revenues to ameliorate the regressive effects of taxes. Earmarking revenues for emission reduction projects, which is popular with voters and improves the perceived effectiveness of carbon taxes. Ensuring revenue neutrality of carbon taxes. In all cases, policymakers need to gather and communicate the objectives and design of the carbon price to improve trust and credibility, before and after the introduction of a carbon tax. This includes communicating emissions reductions achieved and co-benefits of reductions in other pollutants[ii]. The study notes that these recommendations may diverge from “first best” tax designs recommended in the economics literature. However, while the study does not assess the implications of this, it is not clear to me that, even where they exist, these divergences are very significant. They seem to me likely to be easily outweighed by the increased acceptability (a “sub-optimal” carbon tax that can be implemented is usually better than an “optimal” one that can’t). And there are likely to be benefits often omitted in modelling of “first best” designs. This is especially the case as once a tax is in place it can be modified to over time as experience is gained and acceptance increases. For example, phasing in a carbon tax is likely to produce economic benefits by reducing economic dislocation due to a price shock from sudden introduction at its full level, which may at least partly counterbalance the inefficiencies from prices being below optimal levels for an initial period. Similarly, redistribution of revenue to poorer households may provide an economic stimulus benefits as poorer households are more likely to spend the revenue than richer households. It may also increase social solidarity in ways which are conducive to economic welfare and growth. Other emissions reductions, for example improving building insulation and deploying new technologies, may be funded at more nearly optimal levels where there are currently restrictions. However, caution is needed here, and there may often be a stronger case for dispersing funds to citizens. Revenue neutrality can take different forms. One approach is to use revenues to reduce other taxes. This is the approach adopted for the introduction of the carbon tax in British Columbia. Economists tend to favour this type of approach because existing taxes are seen as distortionary. However this approach often lacks transparency and credibility even if accompanying tax cuts are publicised – for example if other taxes are reduced they may be increased again in future. This appears to be one reason why voters tend not to prefer this option. A stronger guarantee is provided when revenue is explicitly returned to citizens. This approach is usually referred to as “tax and dividend” (or “fee and dividend”, or “cap and dividend” in the case of any emissions trading system). I’ve previously noted the advantages of this approach (see here). It has been implemented for the Swiss carbon tax in the form of rebates on health insurance costs. Four provinces in Canada are now working on implementing dividends in the form of direct financial payments to citizens. This will make most citizens better off as the result of the tax, because they will also benefit from revenue raised from businesses. There is an argument made in the environmental economics literature that a lump-sum dispersal to citizens is economically suboptimal, because it is better to use funds to reduce other taxes and so reduce distortions. There is little if any empirical support for this argument as far as I am aware. But in any case taking a view that citizens have more of a natural claim on property rights to the atmosphere than governments makes the limitation of the argument clear. From this perspective, not providing citizens with any of the proceeds from pricing emissions is in effect a 100% tax on those proceeds imposed on everyone. This is indeed non-distortionary – it applies the same tax to everyone irrespective of circumstances – but a fixed per-capita tax is not regarded by governments or their citizens as a good idea anywhere, for sound reasons. A larger objection to returning all revenue directly to citizens, or using it to reduce current taxes, is that emissions run down natural capital for the benefit of current generations at the expense of future generations. Intergenerational justice would, as I’ve previously argued (see here and here), be better served by some combination of preserving natural capital and investing revenue from carbon pricing in a “carbon wealth fund” analogous to a sovereign wealth fund. However this would be unlikely to increase the political acceptability of carbon pricing compared with immediate dispersal of revenues to citizens. Overall, the study makes a range of recommendation that are well justified on a range of grounds, and seem likely to help establish carbon pricing more widely and effectively. It is to be hoped that governments everywhere take note of the findings. Thanks to Maria Carvalho for useful discussions about the background to the study covered by this post. [i] See the World Bank’s State and Trends of Carbon Pricing report here. The definition of carbon pricing adopted in that report is quite broad, but even excluding some of the systems included in the report there remain over 40. [ii] Please see World Bank’s Guide to Communicating Carbon Pricing here for more information on developing an effective communications strategy. This entry was posted in carbon pricing, carbon taxes, climate change, Climate change policy, public opinion and tagged carbon pricing, carbon taxes, climate change, climate change policy on 05/03/2019 by adamwhitmore. This post is a quick update of previous analysis. 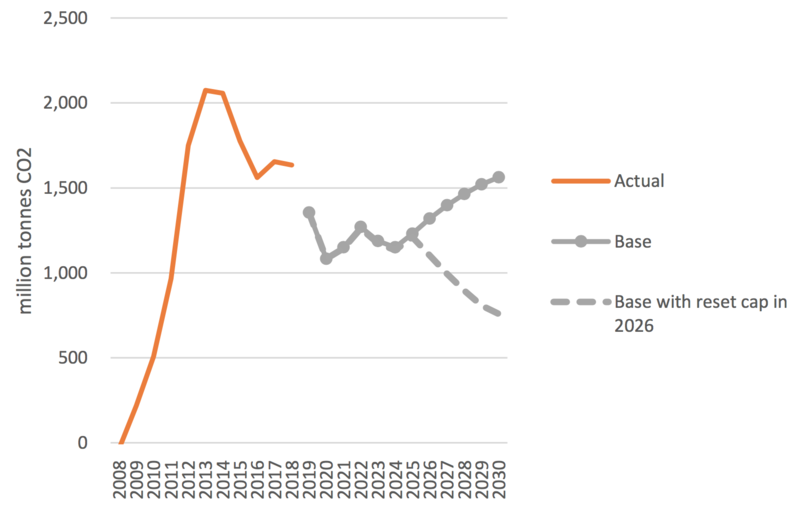 Back in 2013 I pointed out how far from reality the IEA’s projections of renewables deployment were. They persistently showed the rates of installation of renewables staying roughly constant over the following 20 years at whatever level they had reached at the time of the projection being made. In reality, rates of installation were growing strongly, and have continued to do so (see chart). Rates of installation are now a factor of nearly four times greater than the IEA was projecting back in 2013 – they were projecting installation rates of about 28GW for 2018, where in fact around 100 GW were installed in 2017 and an estimated 110GW in 2018. 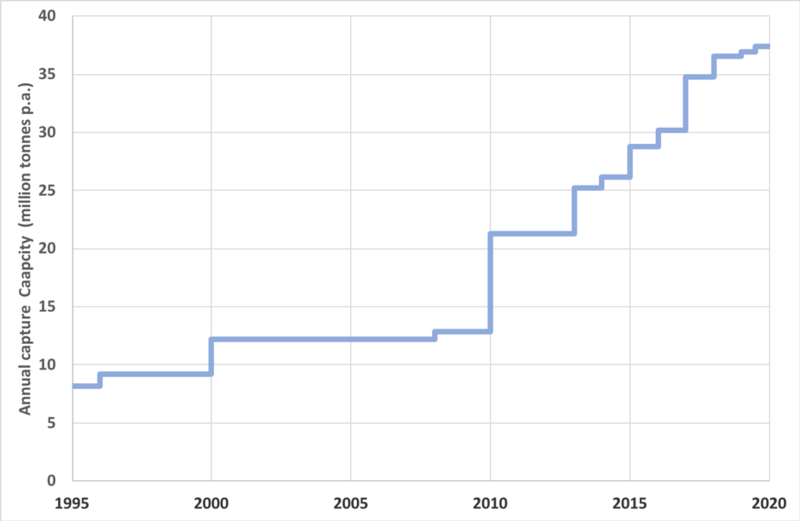 I have returned to the topic since 2013 (see links at the bottom of this post), as have many others, each time pointing out how divorced from reality the IEA’s projections are. Unfortunately, the IEA is continuing with its approach, and continuing to grossly understate the prospects for renewables. 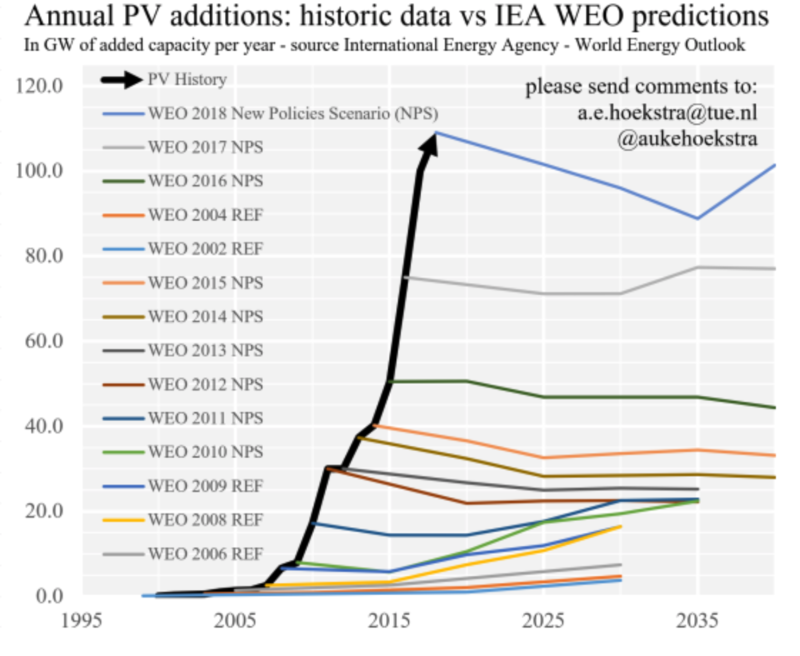 Auke Hoestra has recently updated his analysis of the IEA’s solar PV projections to take account of the latest (2018) World Energy Outlook New Policies Scenario (see link below chart – in addition to chart data his post also contains a valuable commentary on the issue). 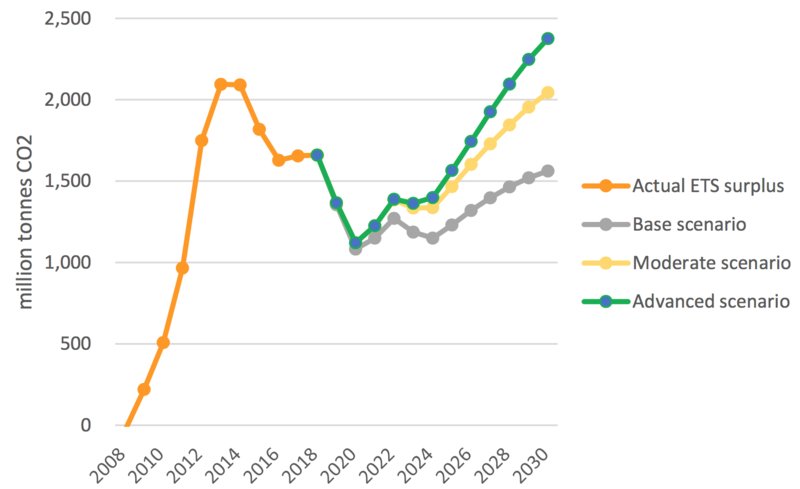 The analysis continues to show the same pattern of obviously misleading projections, with the IEA showing the rate of solar PV installation declining from today’s rate until 2040. Of course eventually the market will mature, and rates of installation will stabilise, but this seems a long way off yet. In 2013 I was inclined to give the IEA the benefit of the doubt, suggesting organisational conservatism led to the IEA missing a trend. This no longer seems tenable – the disconnect between projections and reality has been too stark for too long. Instead, continuing to present such projections is clearly a deliberate choice. As Hoekstra notes, explanations for the disconnect have been advanced by the IEA, but they are unsatisfactory. And as renewables become an ever-larger part of the energy mix the distortions introduced by this persistence in misleading analysis become ever greater. There is no excuse for the IEA persisting with such projections, and none for policy makers taking them seriously. This is disappointing when meaningful analysis of the energy transition is ever more necessary. This entry was posted in climate change, Climate change policy, power generation, renewables and tagged climate change, climate change policy, decarbonisation, energy technology, IEA, IEA renewables, renewables on 21/01/2019 by adamwhitmore. Some simple indicators based on stylised emissions tracks help show clearly the consequences of different rates of emissions reductions. A simple relationship allows the overall objectives – limiting temperature rises and reducing emissions – to be linked in a straightforward way[i]. Over relevant ranges and timescales temperature rise varies approximately linearly with cumulative emissions of CO2, after adjusting for the effect of other greenhouse gases. Specifically, for every 3700 GtCO2 emitted (1000GtC) the temperature will rise by about 2.0 degrees[ii] (with estimates in the range 0.8 to 2.5 degrees)[iii]. This is the transient climate response to cumulative emissions (TCRE). There has been around a 1.0 degree rise in temperatures to date[iv]. 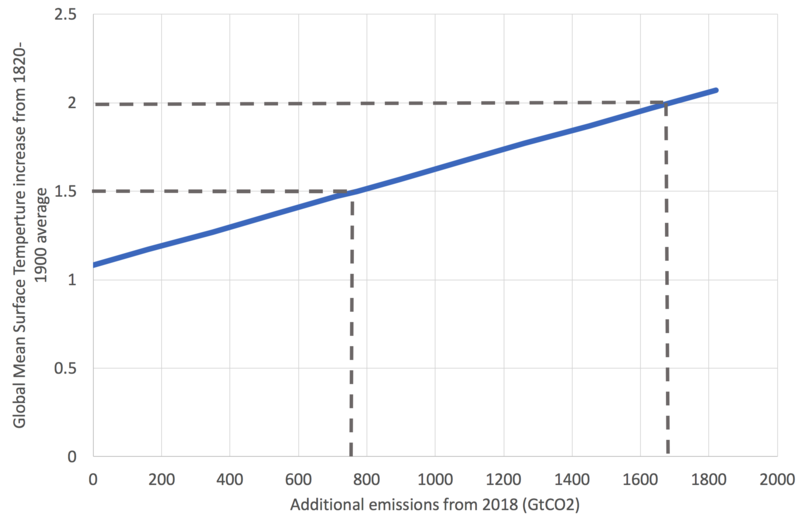 This means the remaining total of cumulative emissions (“carbon budget”) needs to be small enough to keep further temperature rises to around 0.5 to 1.0 degrees if it is to meet targets of limiting temperature rises to 1.5 to 2.0 degrees. The remaining carbon budget for meeting a 1.5 degree target (with 50% probability) is around 770 GtCO2. The remaining carbon budget for meeting a 2 degree target (again with 50% probability) is 1690 GtCO2[v]. This is illustrated in Chart 1, which shows temperature rise (median estimates) against additional emissions from 2018. There are many uncertainties in the estimates of the remaining carbon budget. These include different estimates of the climate sensitivity, variations in warming due non-CO2 pollutants, and the effect of additional earth system feedbacks, including melting of permafrost. These can each change the remaining carbon budget by around 200GtCO2 or more. To look at the implications of this simple relationship we can make the following assumptions about future levels of emissions. These are simplistic, but like all useful simplifications, allow the essence of the issue to be seen more clearly. Net emissions continue approximately flat at present levels (of around 42 GtCO2a. [vi]) until they start to decrease. Once net emissions start decreasing they continue decreasing linearly to reach zero – when any continuing emissions are balanced by removals of CO2 from the atmosphere. They then continue at zero. There are of course many other emissions tracks leading to the same cumulative emissions. For example, many scenarios include negative total emissions, that is net removal of carbon dioxide from the atmosphere, in the second half of the century. Relatively short-lived climate forcings, such as methane, are also greatly reduced, so that they eventually add about 0.15 degrees to warming[vii]. Chart 2 shows various temperature outcomes matched to stylised emissions tracks. Cumulative emissions are the areas under the curves. To limit temperatures rises to 1.5 degrees, emissions need to fall to zero by around 2050 starting in 2020, consistent with the estimates in the recent IPCC report[viii]. 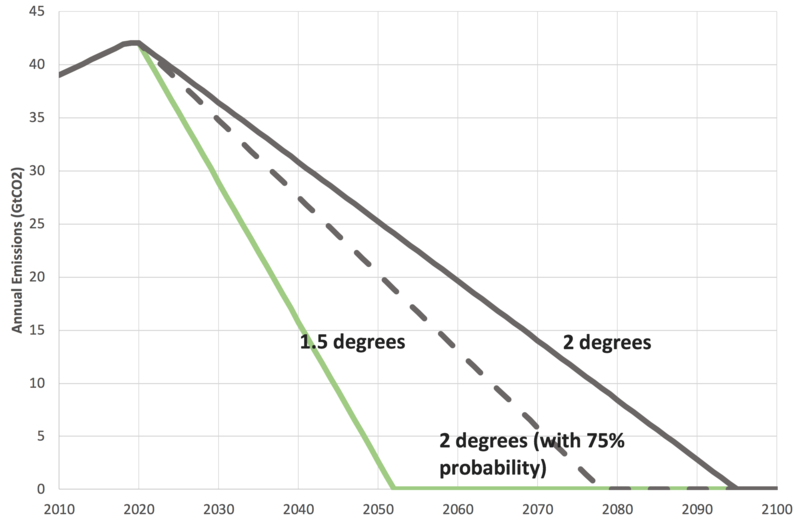 For limiting temperature rises to 2 degrees with 50% probability, zero emissions must be reached around 2095. 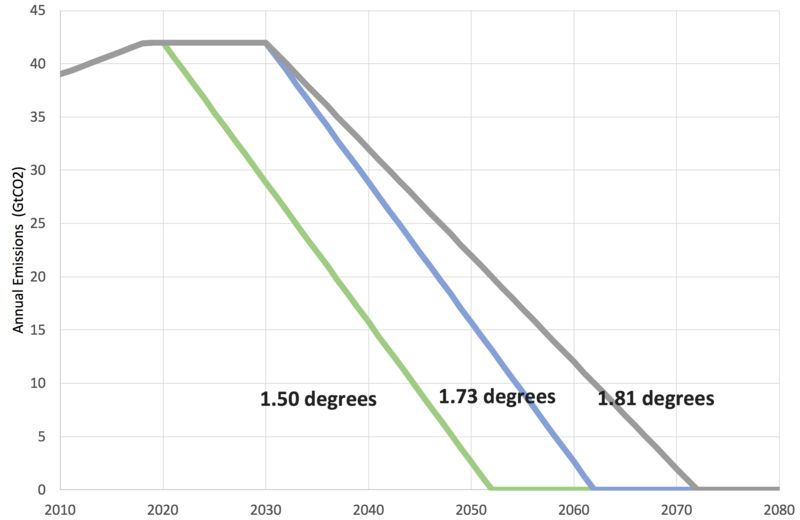 To reach the 2 degree target with 66% probability emissions need to be reduced to net zero about 20 years earlier – by around 2075 from a 2020 start. |To reach a target of “well below” 2 degrees is specified in the Paris Agreement emissions must be reduced to zero sooner. This simplified approach yields some useful rules of thumb. Each decade the starting point for emissions reductions is delayed (for example from 2020 to 2030) adds 0.23 degrees to the temperature rise if the subsequent time taken to reach zero emissions is the same (same rate of decrease – i.e. same slope of the line) – see Chart 3 below. This increase is even greater if emissions increase over the decade of delay. This is a huge effect for a relatively small difference in timing. Delaying the time taken to get to zero emissions by a decade from the same starting date (for example reaching zero in 2070 instead of 2060) increases eventual warming by 0.11 degrees. Correspondingly, delaying the start of emissions reductions increases the required rate of emissions reduction to meet a given temperature target. For each decade of delay in starting emissions reductions the time available to reduce emissions to zero decreases by two decades. For example, tarting in 2020 gives about 75 years to reduce emissions to zero for a 2 degrees target. Starting in 2030 gives only 55 years to reduce emissions from current levels to zero once reductions have begun, a much harder task. These results are, within the limits of the simplifications I’ve adopted, consistent with other analysis (see notes at the end for further details)[ix]. How realistic are these goals? Energy infrastructure often has a lifetime of decades, so the system is slow to change. Consistent with this, among major European economies the best that is being achieved on a sustained basis is emissions reductions of 10-20% per decade. While some emissions reductions may now be easier than they were, for example because the costs of renewables have fallen, deeper emissions cuts are likely to be more challenging. This implies many decades will be required to get down to zero emissions. All of this emphasises the need to start soon, and keep going. The recent IPCC report emphasised the challenges of meeting a 1.5 degree target. But even the target of keeping temperature rises below 2 degrees remains immensely difficult. There is no time to lose. [ii] This is the figure implied in Table 2.2 in http://report.ipcc.ch/sr15/pdf/sr15_chapter2.pdf. All references to temperature in this post are to global mean surface temperatures (GMST). [iv] The IPCC quotes 0.9 degrees by 2006-2015, which is consistent with 1.0 degrees now. [vii] See IPCC 1.5 degree report Chapter 2 for details. [ix] See for example work by Climate Action Tracker https://climateactiontracker.org/global/temperatures/, and and the Stocker and Allan analysis cited as reference (i) above. The recent IPCC report Chapter 2 Section C1, concludes: In model pathways with no or limited overshoot of 1.5°C, global net anthropogenic CO2 emissions decline by about 45% from 2010 levels by 2030 (40–60% interquartile range), reaching net zero around 2050 (2045–2055 interquartile range). For limiting global warming to below 2°C CO2 emissions are projected to decline by about 20% by 2030 in most pathways (10–30% interquartile range) and reach net zero around 2075 (2065–2080 interquartile range). Non-CO2 emissions in pathways that limit global warming to 1.5°C show deep reductions that are similar to those in pathways limiting warming to 2°C.” References in this paragraph to pathways limiting global warming to 2C are based on a 66% probability of staying below 2C. This entry was posted in 2050 targets, carbon budget, climate change, Climate change policy, emissions targets, greenhouse gas emissions, long term targets, Paris Agreement and tagged climate change, climate change policy, emissions targets, long term emissions targets, net zero emissions, Paris Agreement on 23/10/2018 by adamwhitmore. Advancing satellite technology can improve monitoring of emissions. This will in turn help make policies more robust. There are now around 2000 satellites in earth orbit carrying out a wide range of tasks. This is about twice as many as only a decade ago[i]. Costs continue to come down, technologies are advancing and more organisations are making use of data, applying new techniques as they do so. As progress continues, satellite technologies are positioned to make a much larger contribution to monitoring greenhouse gas emissions. Satellites are critical to tracking land use changes that contribute to climate change, notably deforestation. While satellites have played an important role here for years, the increasing availability of data is enabling organisations to increase the effectiveness of their work. For example, in recent years Global Forest Watch[ii] has greatly increased the range, timeliness and accessibility of its data on deforestation. This in turn has enabled more rapid responses. This is now extending to other monitoring. For example, progress on construction projects can be tracked over time. This enabled, for example, monitoring the construction of coal plant in China, which showed that construction of new plants was continuing[iii]. As the frequency with which satellite pictures are taken increases, it becomes possible to monitor not only construction and land use changes, but also operation of individual facilities. For example, it is now becoming possible to track operation of coal plant, because the steam from cooling towers is visible[iv]. This can in turn allow emissions to be estimated. More direct monitoring of emissions continues to develop. Publicly available data at high geographic resolution on NOx, SOx, particulates and in the near future methane[v] are becoming increasingly available[vi]. For example, measuring shipping emissions has traditionally been extremely difficult, but is now becoming tractable, at least for NOx. Measuring methane is especially important. Methane is a powerful greenhouse gas with significant emissions from leakage in natural gas systems. Many of these emissions can easily be avoided at relatively low cost, leading to highly cost-effective emissions reduction. CO2 is more difficult to measure than other pollutants, in part because it disperses and mixes in the atmosphere so rapidly. However, some of the latest satellites have sophisticated technology able to measure CO2 concentrations very accurately[vii]. These cover only quite small areas at the moment but are expected to scale up and allow more widespread direct monitoring. 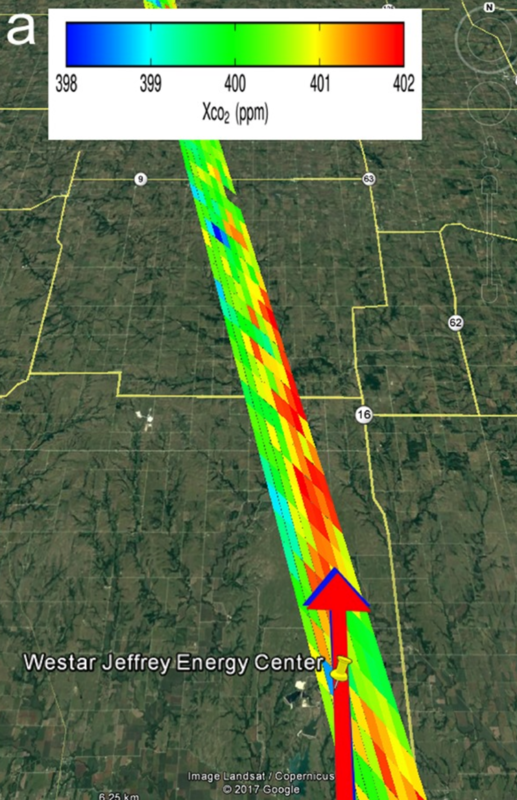 The picture below shows a narrow strip of the emissions from a coal plant in Kansas, based on data from the Orbiting Carbon Observatory 2 (OCO‐2) satellite. These estimates conform well with reported emissions from the plant. Note: the red arrow shows prevailing wind direction. Work is also underway to improve data analysis, so that quantities of emissions can be attributed to individual plants. Machine learning holds a good deal of promise here as a way of finding and labelling patterns in the very large amounts of data available. It is likely soon to be possible to monitor emissions from an individual source as small as a medium size coal plant, taking account of wind speed and direction and so forth. These developments will make actions much more transparent and subject to inspection internationally. Governments, scientists, energy companies, investors, academics and NGOs can monitor what is going on. Increasingly polluters will not be able to hide their actions – they will be open for all to see. This is turn will make it easier to bring pressure on polluters to clean up their act, potentially including, for example, holding countries to account for their Nationally Determined Contributions (NDCs) under the Paris Climate Agreement. Improved transparency and robust data are not in themselves solutions for reducing climate change. Instead, they play an important role in an effective policy architecture. And the do so with ever increasing availability and quality. This gives cause for optimism that policies and their implementation can be made increasingly robust. Thanks to Dave Jones for sharing his knowledge on the topic . This entry was posted in climate change, Climate change policy, emissions targets, greenhouse gas emissions, Paris Agreement and tagged climate change, climate change policy, decarbonisation, deforestation, energy technology, Paris Agreement, power generation on 12/09/2018 by adamwhitmore. CCS has not yet been implemented on a scale needed to make a substantial difference to climate change. However it continues to look necessary for the longer term, with more projects necessary to get costs down. A decade or so ago many people expected rapid development of Carbon Capture and Storage (CCS) as a major contributor to reducing global emissions. I was one of them – at the time I was working on developing CCS projects. However, the hoped-for growth has not yet happened on the scale needed to make a material difference to global emissions. Between 2005 and 2020 capture will have grown by only around 25 million tonnes p.a.. This is only 0.07% of annual global CO2 emissions from energy and industry. In contrast the increase in wind generation in 2017 alone reduced emissions by around 60 million tonnes[ii], so wind power reduce annual emission more from about 5 months’ growth than CCS will from 15 years’ growth – though it took wind power several decades to get to this scale. The picture gets even less promising looking at the types of projects that have been built. The chart below shows the proportion of projects, measured by capture volume, in various categories. The largest component by some distance is natural gas processing – removing the CO2 from natural gas before combustion – which accounts for over 60% of volumes. This makes sense, as it is often a relatively low cost form of capture, and is often necessary to make natural gas suitable for use. However, it will clearly not be a major component of a low carbon energy system. Much of the rest is chemicals production, including ethanol and fertiliser production. These are helpful but inevitably small. There are just two moderate size power generation projects and two projects for hydrogen production, which is often considered important for decarbonising heat. Furthermore, most of the projects separate out CO2 at relatively high concentrations or pressures. This tends to be easier and cheaper than separating more dilute, lower pressure streams of CO2. However it will not be typical of most applications if CCS is to become more widespread. This slow growth of CCS has been accompanied by at least one spectacular failure, the Kemper County power generation project, which was abandoned after expenditure of several billion dollars. Neither the circumstances of the development or the technology used on that particular plant were typical. For example, the Saskpower’s project at Boundary Dam and Petra Nova’s Texas project have both successfully installed post combustion capture at power plants, rather than the gasification technologies used at Kemper County. Nevertheless, the Kemper project’s failure is likely to act as a further deterrent to wider deployment of CCS in power generation. There have been several reasons for the slow deployment of CCS. Costs per tonne abated have remained high for most projects compared with prevailing carbon prices. These high unit costs have combined with the large scale of projects to make the total costs of projects correspondingly large, with a single project typically having a cost in the billions of dollars. This has in turn made it difficult to secure from governments the amount of financial support necessary to get more early projects to happen. 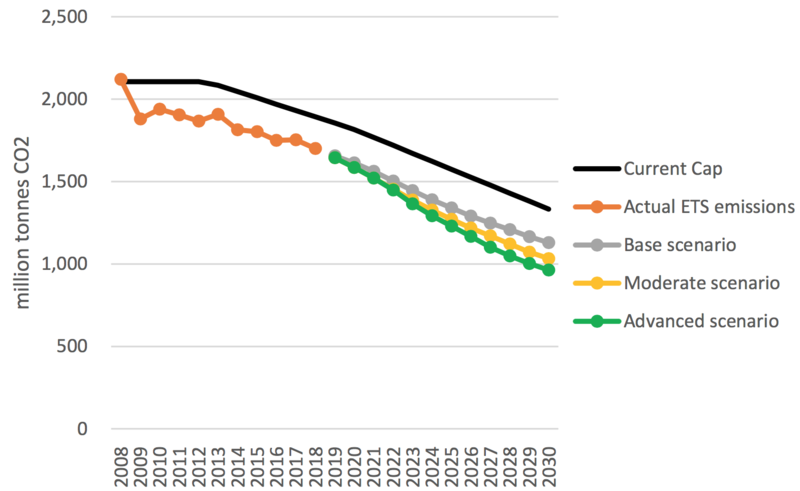 Meanwhile the costs of other low carbon technologies, notably renewables, have fallen, making CCS appear relatively less attractive, especially in the power sector. The difficulties of establishing CCS have led many to propose carbon capture and utilisation (CCU) as a way forward. The idea is that if captured CO2 can be a useful product, this will give it a value and so improve project economics. 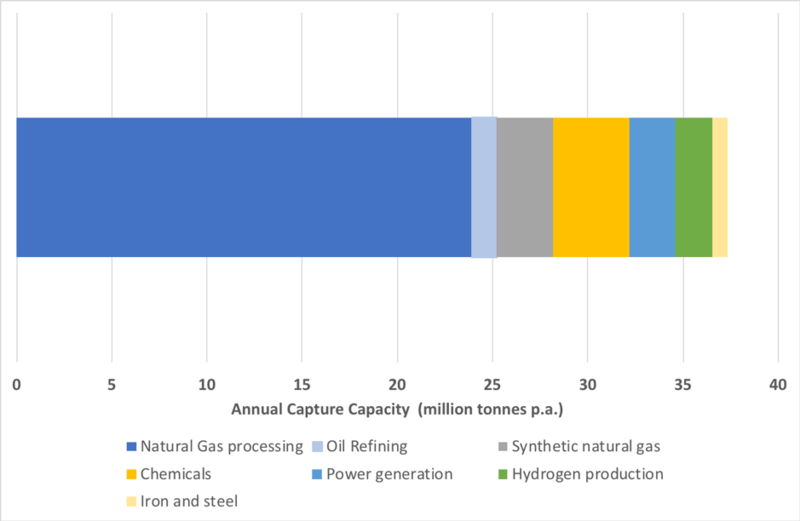 Already 80% by volume of CCS is CCU as it includes use of the CO2 for Enhanced Oil Recovery (EOR), with project economics supported by increased oil production. Various other uses for CO2 have been suggested. Construction materials are a leading candidate with a number of research projects and start-up ventures in this area. These are potentially substantial markets. However the markets for CO2 in construction materials, while large in absolute terms, are small relative to global CO2 emissions, and there will be tough competition from other low carbon materials. For example, one study identified a market potential for CCU of less than two billion tonnes p.a. (excluding synthetic fuels) even on a highly optimistic scenario[iv], or around 5% of total CO2 emissions. It is therefore difficult to be confident that CCU can make a substantial contribution to reducing global emissions, although it may play some role in getting more early carbon capture projects going, as it has done to date through EOR. Despite their slow growth, CCS and CCU continue to look likely to have a necessary role in reducing some industrial emissions which are otherwise difficult to eliminate. The development of CCS and CCU should be encouraged, including through higher carbon prices and dedicated support for early stage technological development. As part of this it remains important that more projects CCS and CCU projects are built to achieve learning and cost reduction, and so support the beginnings of more rapid growth. However in view of the lead times involved the scale of CCS looks likely to continue to be modest over the next couple of decades at least. [i] CO2 will generally be produced in making the energy necessary to run the capture process, compression of the CO2 for transport, and the rest of the transport and storage process. This CO2 will be either emitted, which reduces the net gain from capture, or captured, in which case it is part of the total. In either case the net savings compared with what would have been emitted to the atmosphere with no CCS are lower than the total captured. [ii] Wind generation increased by a little over 100 TWh between 2016 and 2017 (Source: Enerdata). Assuming this displaced fossil capacity with an average emissions intensity of 0.6 t/MWh (roughly half each coal and gas) total avoided emissions would be 60 million tonnes. This entry was posted in 2050 targets, CCS, climate change, Climate change policy and tagged carbon pricing, climate change, climate change policy, energy technology, power generation on 25/04/2018 by adamwhitmore.